An elongated cell moved through the Rockford area around 6:30pm tonight with strong winds and hail. The west side of town, Winnebago, and Pecatonica were hardest hit by this storm. Although no damage reports have come in with this storm, we encourage you to write us (weather@wtvo.com) if you've experienced any damage with this storm or any future storms this evening. Another cell is approaching southern DeKalb county as of this writing. Although DeKalb county isn't under a warning as of this writing, we can't rule-out that happening. A warning has been issued for LaSalle county already. The National Weather Service out of the Quad Cities issued a severe thunderstorm warning just before 2:30 this afternoon for Stephenson County. A line of storms about 50 miles wide moved through from southwest to northeast across far NW Illinois. The southeastern tip of this line weakened just before it moved through western Stephenson county around 2:45. So significant wind and hail probably didn't occur with this line. 6:00pm Update: Storms continue to move across northern Illinois and southern Wisconsin this evening around 70-75 mph. While we are under a Tornado Watch until 8pm tonight, the storms that are moving through will more than likely produce very strong winds. A Severe Thunderstorm Warning is in effect for Lee, Ogle, and Winnebago Counties until 6:45pm and Stephenson, Carroll and Whiteside Counties until 7pm. Storms continue move to the northeast with straight-line wind damage being the primary threat into the early evening. Storms will continue to move into northwest Illinois through the evening hours. 1:45pm Update: Severe Thunderstorm Warning for southwest Whiteside County unti 2:45pm. These storms are moving around 70 mph so the main threat from them will be damaging winds. The storms continue to race off to the northeast and will move into northwest Illinois within the next hour. 1:00pm Update: A Tornado Watch has been issued for all of Northern Illinois and Southern Wisconsin until 8pm tonight. Tornado Watch will likey be issued soon for parts of Northern Illinois and Southern Wisconsin. Keep checking back for updates! 11:45am Update: The Storm Prediction Center has updated parts of the WTVO viewing area in a Moderate Risk for this afternoon. We are beginning to cloud over a little this afternoon but the current thinking is that the instability will gradually increase across the area throughout the afternoon after looking at some of the short range computer models. An MCS currently in northeast Missouri will continue to move to the north/northeast into southeast Iowa by this afternoon and western Illinois this evening. It will be interesting to see how well these storms hold together. There is a fairly significant low level jet feeding into the storms that if they do hold together and get here by this evening, damaging winds would be the primary threat. After mid-evening, the threat for severe storms may go down some. 10:00am: The Storm Prediction Center still has much of the Mississippi River Valley in a Slight Risk for severe weather this afternoon and evening. Storms are beginning to develop in South-Central Iowa and Northern Missouri this morning ahead of a cold front and a very strong low level jet feeding into the storms. As a result, a Severe Thunderstorm Watch has been issued for just southwest of the Stateline. For us, we are definitely dealing with gusty winds once again this afternoon with temperatures rising already into the low 70s. Dew points, as of now, have been holding steady. We are still currently in the middle 50s. The "prime area" that we will need to watch for thunderstorm development will be Eastern/Central Iowa and into Missouri. 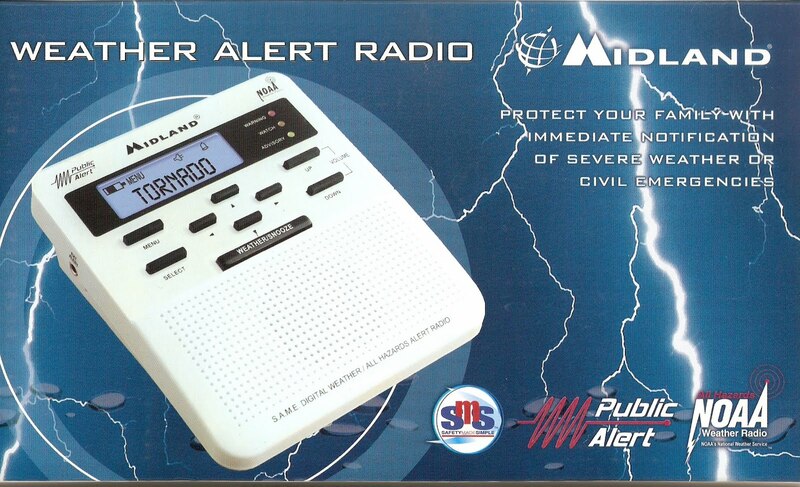 We will continue to monitor the weather and especially the storms out in northern Missouri. As it looks right now, they could move into our area later this afternoon and into the evening with damaging winds being the primary threat. Since Candice so eloquently explained severe weather parameters to you folks, I thought I'd give you an update on our CAPE values. The latest run of our North American Model only predicted a CAPE of about 637 J/kg. Usually, that amount of instability falls well short of severe thresholds. Another parameter meteorologists look at is called the Lifted Index. We usually start thinking about severe weather when the lifted index is between -2 and -5. If the number becomes even more negative than that, the instability becomes greater. The same North American Model I mentioned above is predicting a lifted index of about -1.8 late Friday afternoon. So if you're a severe weather fan, you may be disappointed on Friday evening. A lot of attention has been focused on Friday as far as the severe potential goes - so I wanted to talk a little more about it. There are several parameters that meteorologists look at as far as determining if severe weather will occur. They are; lift, moisture and instability. Looking at the forecast for tomorrow we will have a few of the ingredients needed to produce severe weather but lacking in a few others. The first image on the left shows the moisture advection into the region, or Theta-E. Dew points will continue to rise as winds gust in from the south today and tomorrow. So moisture will be there. Next, we will have a pretty significant jetstream moving just to the west of us with winds coming in around 120 - 140 knots! That means if storms do develop, they would be fast moving storms with damaging winds. The last is the measure of instability in the atmosphere, or CAPE (Convective Available Potential Energy). Any time you begin to get a value of CAPE more than about 1000, the potential for severe weather increases. As of right now we are beginning to approach that value across northern Illinois, but the higher values remain south in central-Illinois. This is what we'll have to watch over today and tomorrow. If we can get sunshine for a good part of the day Friday, the CAPE values will likely increase. However, if the day starts off cloudy because of ongoing storms in Iowa we might not see it rise throughout the day. Thunderstorms will be likely Friday afternoon and into the evening, we'll just have to monitor the conditions throughout the day to see if we can get strong ones to develop. We are in a slight risk for severe weather Friday afternoon so be sure to continue to monitor the weather conditions throughout the afternoon! A Wind Advisory is in effect for all of Northern Illinois until 7pm tonight. Look for winds to continue through afternoon with gusts nearing 35 - 40 mph. We should be able to get a little sunshine in by the afternoon with temperatures reaching the low 70s. A few scattered showers and even a rumble of thunder will be possible to the west this morning. The showers will continue to lift off to the northeast into south-central Wisconsin through the morning. So don't be surprised if you see a few sprinkles on the windshield this morning. Wanted to take some time and talk a little about the weather that is expected later this week and into the weekend. While this afternoon will be beautiful, all eyes are watching the storm out west as it moves closer to the Stateline. Earlier in the week, computer models were forecasting the cold front to come through late Thursday night/Friday morning. Now, as the system has moved onshore we are starting to get a little better of an idea of what will happen as we get closer to the weekend (although there are still some differences). The past couple of days, the front has been slowing because it is running parallel with winds in the upper level of the atmosphere. When that happens, fronts don't typically move all that quickly. Each day, the arrival of the cold front has been pushed back by a few hours. As of this morning, the front is forecast to move through Friday afternoon. With the front coming through later in the afternoon, the potential is there for stronger storms to develop late afternoon and into the evening. As a result, the Storm Prediction Center has highlighted much of the Mississippi River Valley in a "Slight Risk" for Friday afternoon. We'll continue to monitor the model runs as they come out today and tomorrow and have the latest information for you. Believe it or not, frost can form when reported temperatures are above 32 degrees F. There are two reasons for this. Number 1: Official air temperatures are taken 5 to 6 feet above the ground. Because cold air is more dense than warm air, the coldest air within the lowest layers of the atmosphere will settle to the ground at night in absence of significant wind. So it can be 35 degrees, for example, where the official temperature is taken and 32 degrees at the earth's surface. The second reason frost can form in situations when the reported temperature is above 32 degrees F has to do with evaporational cooling. When dew forms on vegetation at, say, 35 degrees, it will stay liquid... But only until it begins to evaporate once the sun or wind hits it. Evaporation is a cooling process. So when some of the moisture on vegetation evaporates, it can cool the surface to 32F or below, causing frost to form. The National Weather Service has issued a Frost Advisory for all of the WTVO viewing area until early Wednesday morning. Temperatures are expected to drop quickly overnight into the low 30s. Clearing skies and light winds will allow frost to develop, especially in rural areas. Be sure to bring plants indoors. Temperatures will quickly rebound once the sun rises. ENSO, or El Nino Southern Oscillation is still in a negative phase as of late April. That is, there is still an El Nino occuring. Warmer than average water is still sitting near the equator off the western South America coast, which is typical of El Nino. But many forecast models have that changing to near neutral (normal) conditions by the end of the summer and, perhaps, to La Nina conditions by this fall. For stateline residents, that means a greater likelihood of a colder winter in 2010-11. While we were dealing with a few rain showers this past weekend, many in the south were dealing with a deadly tornado outbreak. A very strong storm system brought an extended period of severe weather to the south Friday afternoon that lasted until late Saturday night. Scattered severe thunderstorms developed and moved across northeast Louisiana and parts of Mississippi with several reports of large hail and wind damage. Even though the storms Friday didn't cause too much widespread damage, a much more danagerous situation evolved Saturday morning where two seperate clusters of storms moved across southeastern Arkansas and northwestern Mississippi, with another moving through south central and southeastern Mississippi. The most destructive storm of the day developed over northern Louisiana during the mid to late morning hours. The first report of damage was received a little after 11am near the city of Tallulah, LA. It was only after that, that things got worse as the storm tracked across the entire state of Mississippi producing significant damage with several tornadoes. Multiple fatalities and injuries were reported in association with this storm along with reports of structures either damaged or destroyed. This was a pretty significant day weather wise because of the time of day the tornadoes moved through. Typically, you don't see long lived, deadly tornadoes in the morning in that area. It was also the first time this year that the Storm Prediction Center issued the highest alert they could, putting the south in a "high" risk for tornadoes that day. Thankfully the weather the next couple of days should remain fairly quiet to allow them to pick up the pieces. To read more on the damage reports from that area, click here to access the National Weather Service out of Jackson, MS. Improving Weather Conditions to Start off the Work Week. Strong low pressure that brought rain to the Stateline is over western Indiana moving away from the area. There still could be some scattered light rain showers this evening. It will remain mostly cloudy overnight. The clouds will break up during the morning on Monday yielding mostly sunny skies during the afternoon. High pressure will take control of the weather, and with clear skies on Monday night the temperatures will drop into the middle 30's. There could even be some patchy frost in southern Wisconsin after midnight on Monday night, and better chance again on Tuesday night that may result in some frost across parts of northern Illinois. With high pressure in place on Tuesday and Wednesday there will be brilliant sunshine and blue skies. Highs will be in the low 60's on Tuesday and the mid to upper 60's on Wednesday. Skies will become mostly cloudy on Thursday in advance of the next weather system to move eastward through the plains. With a warm southerly wind flow temperatures will reach the low 70's on Thursday. There is a slight chance of some showers and thunderstoms across part of southern Wisconsin on Thursday. As the system gets closer chances of showers and thunderstorms will increase for the entire area Thursday night, and the system will get bogged down, so we will have continued chances of showers and thunderstorms through the entire weekend. A strong storm system over southeastern Missouri will move across to central Illinois tonight, and across northern Indiana on Sunday bringing showers, and some rumbles of thunder before midnight, and rain after midnight tonight. Sunday will be a rainy, windy, and cooler day with temperatures struggling to get above the low 50's. Winds will be brisk from northeast 15 to 25 mph tonight with gusts to 30 mph tonight, and shift to more northerly on Sunday. Rain showers will gradually come to an end Sunday night as the low continues to pull away toward northwestern Ohio by early Monday morning. There will be some weak ridging across the area on Monday, allowing for skies to become partly sunny, but a disturbance moving in from the west coast could cause some isolated showers on Monday afternoon into Monday evening. Tuesday is expected to start off partly cloudy, but become mostly sunny as high pressure ridges back into the area from the plains and Canada. Skies look to be sunny with the high pressure shifting east across the area on Wednesday. By Thursday morning a fairly strong southerly winds will develop as a new weather system begins to move eastward across the plains. With a warm front to our southwest there may be enough lift to generate some scattered showers on Thursday into Thursday evening. On Friday the warm front will lift northward across the Stateline lifting temperatures into the low 70s, and kicking up some thunderstorms that will persist off and on through Friday evening when the cold front will move through shutting down the precipitation. Drizzle/light rain showers continue to move northeast out of the Quad Cities this morning ahead of a warm front that will lift northward throughout the day. With this track, light rain should begin to move into southern Lee county within the hour. More widespread rain is expected to develop later this afternoon and evening. The last time we saw measurable rainfall at the Rockford airport was April 8th. That's more than two weeks ago! (Yes, we did see a trace of rain yesterday along with two other occasions this month. But that doesn't add to the tally.) More than 2" of rain fell on Rockford between April 4th and 8th. Despite that, we're running about 0.3" behind normal for the month. The timing isn't ideal for the dry spell to end this weekend, but that's what is going to happen as a storm system mentioned in a previous post moves into the Midwest. Temperatures this month are also running well above average. We're 8.3 degrees above normal for the month to date! Although cooler air will fill-in behind this system on Sunday, temperatures will be near average for this time of year for most of next week. With the exception of early April, we've been pretty high and dry throughout the month. That will all be changing as Friday comes around. A slow moving storm system currently in the southwest will begin it's move across the Plains today and tonight bringing severe weather to parts of the central and southern Plains this afternoon. As the system moves closer to the Great Lakes, a warm front will begin to move north across Illinois Friday. At the surface, easterly winds will keep the dry air in place through the morning but rain will become likely into late morning/early afternoon. We will remain on the north side (or cool side) of the front Friday, so any severe weather should stay south where more moisture, warmer temperatures and wind shear will be available. The front should stay just to our south through the weekend before the storm moves out Monday morning. While we won't have much of a severe threat, thunderstorms will still be possible along with the potential for some heavy rain. With the low not moving much this weekend and the continued influx of moisture, there could be some periods of heavy rain Friday night/Saturday morning and once again Saturday night into Sunday morning. Looking at some of the rainfall total forecasts - anywhere between one to two inches could fall over the weekend! We could sure use the rain but we definitely don't need it all at once! As we all know, the ash from the volcano has caused numerous problems for air traffic in Europe. For about a week, flights have been cancelled due to ash moving over the Atlantic. Just now are some flights beginning to resume. The ash has mainly been confined to mostly Europe but a little bit is beginning to migrate back west thanks to high pressure south of Greenland. As a result, there is an Advisory for Eastern Canada - however, they have not seen signs of any ash yet. 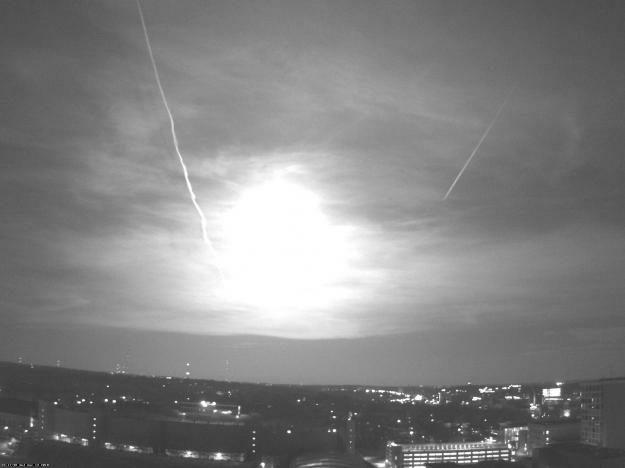 And as of right now, there looks to be no impact of the ash to the U.S.
Satellite and computer models are the best ways to track and forecast ash plumes. However, with this particular volcano scientists have had a hard time trying to pinpoint exactly where and how the ash will move. The reason, numerous puffs from the volcano have made it difficult for models to keep track and forecast future dispersion. 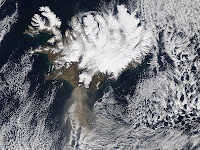 Satellites also prove to be very useful, but the further away the ash cloud is from the volcano the harder it is to detect due to the density of the particles. That is why the FAA has been very cautious with this volcano. They have a "no tolerance" rule for planes flying when there is volcanic ash around. The ultimate goal with this Iceland volcano eruption is to get new information to develop new models for detecting and prediction ash plumes. Click here for more information on the HYSPLIT (Hybrid Single Particle Lagrangian Integrated Trajectory) model. I dare you to say that five times!! As far as global climate impacts from the volcano - very little is expected. To see any type of impact on climate, the ash would have to make it into the stratosphere which is about 10,500 m (33,000 ft) high. The ash from the Eyjafijallajokull volcano has only made it to 10,000 m, and has actually been decreasing in height the past couple of days. Eruptions that happen in the tropical belts tend to have a greater impact on climate because of the ability of the ash to circulate the globe. 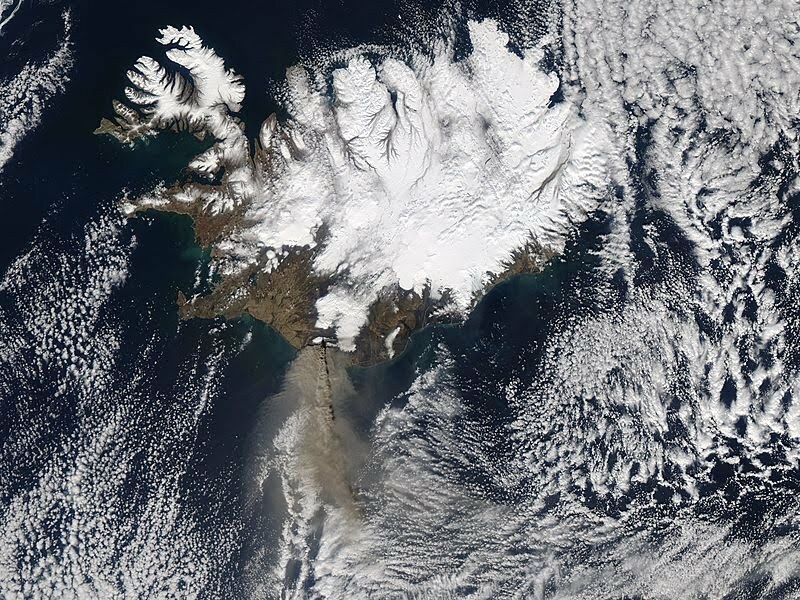 Eruptions in higher latitudes, like Iceland, tend to remain confined to the higher latitudes. Locally, there may be some effects that are felt in Europe but anything widespread is not anticipated. Slower start to severe weather across most of the U.S. It may not seem like it to Stateline residents -- especially after the bout of severe weather we experienced on April 5th with hail and high winds. But tornadic activity and severe thunderstorms are down for the nation in 2010 compared to the last two years. By this time in 2008, we'd seen nearly 450 U.S. tornadoes. This year, we've only seen about 70 of them. Lighting strikes are down, too. An estimated 500 thousand have hit the U.S. to date this year, compared to about 2 million at this time in 2008 and about one million in 2009. The main reason that the usual severe weather hot spots haven't seen their share of action so far is a cool Gulf of Mexico. The Gulf of Mexico is the primary source of moisture for thunderstorms. This year, most of the Gulf is running 1 to 2 degrees Celsius below average... That's about 2 to 4 degrees Farenheit. Cooler water is less volitile... It doesn't evaporate as readily. Therefore, the air above the Gulf is drier than it usually is in April, and moisture transport northward into tornado alley is less boisterous than it usually is. According to NOAA (National Oceanic and Atmospheric Administration), the world's combined global land and ocean surface temperatures made March the warmest March on record. Looking seperately at ocean and land - average ocean temperatures were the warmest for any March and the global land surface temperature was the fourth warmest March. Adding to that, the planet has seen the fourth warmest January - March period on record. 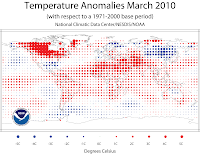 The combined global land and ocean average surface temperature for March was 56.3°F, which is almost 1.39°F above the 20th century average. 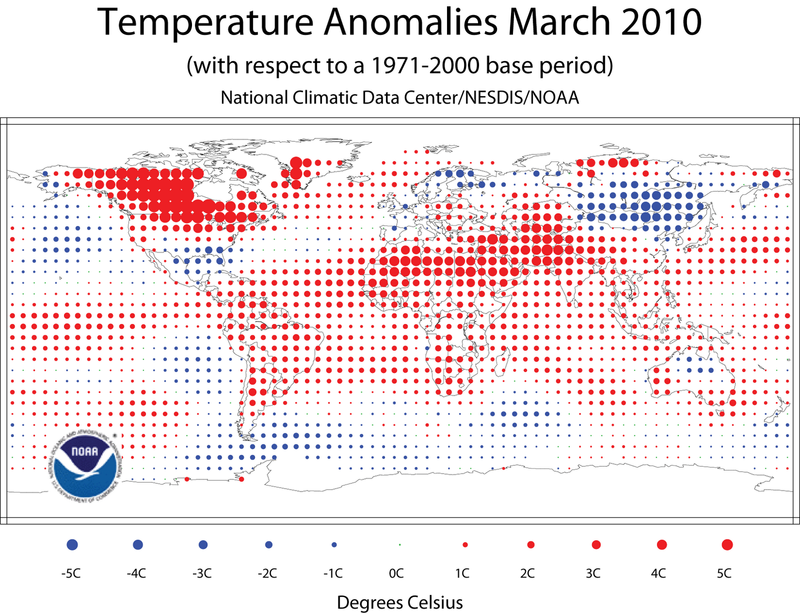 Ocean surface temperatures worldwide were the highest for any March on record: 1.01°F above the 54.9°F average. Global land surface temperatures were 2.45°F above the average which sits at 40.8°. The image above shows the "difference from average", which gives more of an accurate picture of temperature change. From that, you can see Northern Africa, South Asia and Canada were warmer than normal. Parts of Russia, Northern and Western Europe, Mexico, Northern Australia, Western Alaska and the Southeastern US were cooler than normal. Even though El Nino weakened to moderate strength during the month of March, it still contributed to the warmth in the tropical belt and overall ocean temperatures. Looking into this Spring, El Nino is expected to continue before possibily returning the neutral conditions by summer. A sprawling area of high pressure centered from Lake Superior to southwest Iowa will continue be the dominate weather feature in Stateline weather through Tuesday as it shifts slowly eastward across Illinois and Wisconsin through the Great Lakes, and then off the east coast by Wednesday morning. It is of Canadian origin, so dew points are low, and will allow for a big drop off in temperatures after sundown through the night. Temperatures by daybreak Monday morning will be cold enough (in the low to middle 30's) for some patchy light frost to form in most favored low lying areas. With full sunshine on Monday temperatures will recover very nicely, and reach the low to middle 60's by mid afternoon. As the high shifts a little further east on Tuesday afternoon temperatures will edge up a few more degrees, and there will be some high level cloudiness. On Wednesday a backdoor cool front will slip across the Illinois/Wisconsin Stateline from the north, but no rain is expected because of very dry air in place. That front will stall out, and become stationary across central or southern Illinois on Thursday. With a new weather system kicking out of the Rockies into the west central plains, clouds will increase, and there will be a slight chance of showers later Thursday into Thursday night. By Friday morning a warm front with an increasing southerly air flow from the Gulf of Mexico will begin moving northward across Illinois as a low pressure storm center intensifies over Nebraska. Moisture riding up and over the warm front to our south will begin to increase our chances of showers and thunderstorms on Friday. The warm front should reach the Stateline by early Saturday morning continuing our chances of showers an thunderstorms through Saturday night when a cold front from the west will push the activity eastward out of our area. It will be cooler on Sunday under partly cloudy skies. An area of high pressure is ridging southward out of Canada across the northern and central plains. The northerly wind flow to the east of the ridge across the upper midwest is bringing very chilly dy air into the Stateline. A FROST ADVISORY is in effect for north central Illinois from 1 am Sunday until 7 am Sunday morning. With winds dying off, and very dry low dew point air in place, temperatures will fall quickly with strong radiational cooling. Frost is likely to begin to develop in spots after 1 am and become widespread just before daybreak. After a cold frosty start, temperatures will warm up quickly on Sunday under the influence of more than 12 hours of full sunshine through crystal blue skies. The afternoon high will be close to the seasonal average in the low 60's. With light winds and clear skies again on Sunday night we can expect a rapid drop off in temperatures after dark to a low in the middle 30's early Monday morning. Monday will be another sunny day. Temperatures will edge up slowly from early to mid week as the high shifts eastward. By Wednesday night a low pressure storm system will be spinning over the central plains, and it may bring us some widely scattered showers. Chance of showers and some thunderstorms will increase Friday and Friday night, and may linger into next Saturday. A Frost Advisory is in effect for all of Northern Illinois late tonight until Sunday morning. I know it's been pretty tempting the past couple of weeks to get out in the garden early, we've already started the growing season, but with temperatures expected to dip near the freezing mark tonight bring plants that you can in and cover up the ones you can't! It's going to be a chilly one! 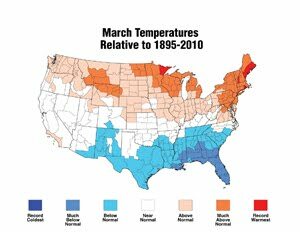 Looking back at the month of March, NOAA's State of the Climate reports shows the average temperature of the United States was warmer-than-average with several states in New England experiencing one of the warmest March's on record. The overall temperature across the US was 44.4°, which is 1.9° above the long-term average. The South and Southeast experienced below normal temperatures due to several storms that developed along the Atlantic Coast. 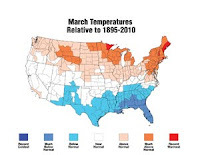 Thirteen states had an average temperature that were among their 10 warmest for March including Rhode Island, which is interesting because it was the wettest January - March for them. Cooler than normal temperatures were seen across the Gulf Coast, New Mexico, Georgia and South Carolina. Florida had its fourth coolest March on record. 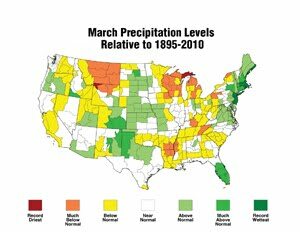 As far as precipitation goes, March was below the long term mean. 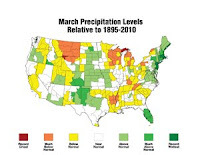 The national rainfall average was 2.16 inches, 0.24 inches below average. Looking at other highlights from March, the preliminary tornado count was 36, which tied for the 4th quietest March since 1950. Mid-March ice coverage over the Great Lakes was at a record low with only 3.5 percent of the Lakes' surface. Just to put that in perspective, the average ice extend is roughly 31 percent - according to the Canadian Ice Service. You may recall all the heavy rain, hail, wind and lightning we received in the Stateline area a little over a week ago. 2.3" of rain fell in Rockford between April 3rd and 7th. The majority of this rain fell ahead of a cold front that dropped our high temperatures from the 70s on the 4th, 5th, and 6th to 49 degrees on April 7th. Although the front that will pass through the area very early Friday morning will bring a 20 or so degree drop in temperatures, it won't bring us nearly as much rainfall. As of this writing, only a narrow band of light rain (about 30-50 miles wide) is approaching us from the west. Also, our dewpoint temperatures are still in the 40s... A sign of dry air. Although slightly more robust dewpoints in the upper 50s and low 60s can be found right along the front in eastern Iowa and parts of western Wisconsin, this pales in comparison to the widespread 60+ degree dewpoints we saw ahead of last weeks front. A few spots might see a brief heavy shower with thunder tonight, otherwise I'd be surprised to see many of us get more than about 1/4 inch of rain. Early Green Not a Good Thing? Needless to say, things are greening-up a bit ahead of schedule across the area. Trees are budding and flowers are blooming about 2-3 weeks early. As you'd imagine, that's because of all the warm weather we've had recently. Rockford's average temperature is running about 10.2 degrees F above average so far in the month of April. Although the budding foliage is nice to look at after a long winter, it could come back to haunt some of us. As Morning Meteorologist Candice King said in an earlier post, Rockford's average last freeze is May 1st... That's more than 2 weeks away! If we do get a freeze, that could permanently kill some of the blossoms on the trees. Meteorologist Eric Nefstead and I were talking about this problem earlier this afternoon. He bought to my attention that some apple-growers could have a disappointing crop if freezing temperatures hit them now. So the warm weather we've had can be a blessing AND a curse. Let's just hope our hard freezes our over with for the spring! High pressure is set up across much of the central US, allowing temperatures this afternoon to warm into the upper 70s to low 80s! With the ridge in place, the low will move north into Southern Canada before moving into the Great Lakes Friday afternoon. This pattern, however, is different from what we've experienced this past winter because we had a persistent trough settled across much of the US. That allowed the storms to move south into the Mid-Atlantic and up the East Coast bringing record snowfall to some. This pattern keeps the Southeast dry while bringing rain in the northern Plains and snow to the Rockies. The ridge will gradually break down as a cold front moves in bringing temperatures back to "average" by the weekend. How did the VORTEX 2 project do? VORTEX 2 (Verification of the Origins of Rotation in Tornadoes Experiment 2) was the largest research project in history to explore how, when and why tornadoes form. While it was pretty quiet last summer, not ideal for storm chasing, they did manage to find a couple good storms. You can watch a recap of the project here! To learn more about the VORTEX 2 project, click here! Their hope is to be able to go out again this summer. Let's keep our fingers crossed this year will be a better one! Looking at temperatures across the region, I'm sure you can pick out where the warm front sits. Monday, I talked about how the warm front would have a little bit of a hard time trying to move North because of winds coming in from Lake Michigan thanks to high pressure northeast of the Great Lakes. Our wind direction is from the East (and gusty at times) which isn't the ideal direction for allowing temperatures to rise. Look at the temperature in Milwaukee (at 10am) - it's only 49° while further west away from the lake, temperatures have risen into the 60s and even 70s thanks to more of a southerly wind. The front will gradually move North tonight and tomorrow as the high pressure system moves south. By tomorrow, we should all be on the warm side of the front with temperatures rising into the mid to upper 70s! We have been pretty lucky the past week and a half as far as temperatures go. Looking back at highs, all but two days have been above average. Average high temperatures the beginning of April sit in the lower 50s, while the end of April temperatures reach the mid 60s. April started off with record warmth across much of the Great Lakes; Rockford reached 84°. The only two days we've seen where temperatures have fallen below average were on the 7th and 8th. While it will be a little cooler for the weekend, we should be able to warm again into next week. Looking ahead towards the end of April, however, we may cool back to average if not a little below. I'm sure many of us has caught the "spring fever" bug the past week and a half with temperatures sitting well above average for a good part of April. You may even have thought about getting in the garden. Well, you might want to hold off on that thought at least until the end of the month. Even though it has been fairly mild, the average last freeze for much of Northern Illinois doesn't occur until the end of April/beginning of May. A cool front is settled across central Illinois on Sunday, and will move back toward the north as a warm front on Monday. High pressure over the Great Lakes will dominate our weather tonight, but clouds will increase late tonight, and it will be mostly cloudy as the warm front approaches from the southwest on Monday. The air is very dry with very low dewpoints, and high pressure is all set to build in aloft so chances of thunderstorms are minimal. However, there may be just enough instability on Monday afternoon to allow a couple of t-storms to develop. Areal coverage, if they do materialize, will be very low, and they will be relatively weak. The warm front will be right overhead on Tuesday and Wednesday with an increasing south/southeasterly flow at the surface, and increasing moisture associated with the low level jet. Contrary to what you may think, chances of precipitation will be almost nil because of building high pressure aloft over our region capping activity here. There is a likelyhood of plentiful shower and thunderstorm activity to the north across central and northern Wisconsin. With the warmer air continuing to feed into our area, temperatures will reach into the low 70's again by Tuesday, and the upper 70's by Wednesday, which probably will be the warmest day of the week. You will not have to go all that far south in Illinois on Wednesday to find 80 degree weather...probably just south of Interstate 80. The weather will become more active on Thursday with increasing chances of showers and thunderstorms. It will not be as warm on Thursday as skies become mostly cloudy along with the threat of thunderstorms. It will be a little cooler heading into next weekend, but temperatures will still be above average. The models diverge in their handling of weather systems so the confidence level for forecasting weather conditions is low late in the week. Have a great week! Rockford saw another mild day on Saturday. With a high of 72 degrees and a low of 40 degrees the average temperature was above normal again for this time of year again. Seven out of the first 10 days of April have been above average. You may ask yourself... "Ok, I thought so, but by how much?" The answer is by an unheard of 10.9 degrees. If this were to continue for the the entire month of April, it would end up being one of the warmest Aprils on record, and records for Rockford go back to the early 1900's. We have had two 80+ degree days, and four 70+ degree days so far this month. You may think..."This is great!"... but hold fon a second. All this warm weather is advancing our vegetation too fast. Buds are swelling, and almost ready to break on the fruit trees. They will break this next week if the warm weather continues, and the blossoms will be on the trees before you know it. This is problematic, because if we get more cold snaps that drop temperatures below freezing after blossoms appear, there is a risk of the loss of the entire fruit tree crop across the Stateline this season. This is something to be aware of because the last date of our last killing frost in the spring around these parts is between May 7th and May 11th. So, it would be better if the temperatures dropped back to more seasonal levels. What is the likelihood of that happening? Well, again, it appears as if the main jet stream will remain off to our north for the next several days, at least, and temperatures will be above normal all next week with 70's likely again next Thursday and possibly Friday. There is a chance it may even approach 80 again on Thursday. So, there is a valid concern about what will happen with the apple blossoms this spring. The other side of the coin is.... that it is entirely possible that we may not get another killing frost after the apples are in full blossom, and then, of course, everything would be fine. -15 below zero. There in no indication of any of that cold air headed in our direction. Of course, even if it were to make a move on us, the temperatures would be greatly modified by the time the air mass got here under the influence of the powerful April sun. A weak cool front passed though the Rockford area late this afternoon swinging winds around the northwest. There are some very light rain showers, probably best classified as sprinkles lagging behind the front. The air is very dry so, despite lift assoiated with the front very little rain is being squeezed out. There may be some sprinkles overnight that could possibly linger into the early morning on Sunday.pressure with even drier air will work it's way into the area on Sunday afternoon, skies will become partly cloudy. Building high pressure will move across southern Canada, and the northern Great Lakes, and our winds will shift from the north to the northeast to the east by Sunday afternoon. The high will continue to an influence on our weather thru Wednesday. The next system to affect the Stateline will approach from the west on Wednesday night. There will be a chance of showers and thunderstorms thru Friday night. Stanley Idaho sits high in a northern Rocky Mountain valley at an elevation of 6,253' above sea level. That's a shade higher than Denver. The reasons Stanley gets so cold are its northerly latitude, elevation, and the fact that it sits in a valley. On clear, calm nights, cold air from the surrounding mountains drains into town. That's because cold air is more dense -- or "heavier" -- than warm air. Although northern IL doesn't have mountains, we can also see temperatures drop in some of the low spots at night. Tonight will be an interesting night to watch for that. Winds are light and skies should remain mostly clear through daybreak. It'll be interesting to see if Rochelle -- which sits in a low, swampy area -- falls close to the freezing mark again... Even though temperatures in most spots will only drop into the mid and upper 30s. Let's talk a little about radiation. It sure was chilly this morning thanks to clear skies and light winds. Temperatures fell into the upper 20s to low 30s. We all know that the sun is the main weather maker across the globe. The sun emits shortwave radiation to help heat up the atmosphere. The solar radiation absorbed by the Earth causes the planet to heat up until it is emitting as much energy back into space as it absorbs from the sun. When we typically see a cloudy afternoon, not much of that radiation is able to make it to the Earth. That's why typically on mostly cloudy days temperatures wouldn't be as warm as on a sunny day (cloud thickness will also play a factor). The opposite holds true for night. The Earth emits longwave radiation and while some of it is allowed back into space, some of it is also sent back to Earth helping to keep the atmosphere warmer. 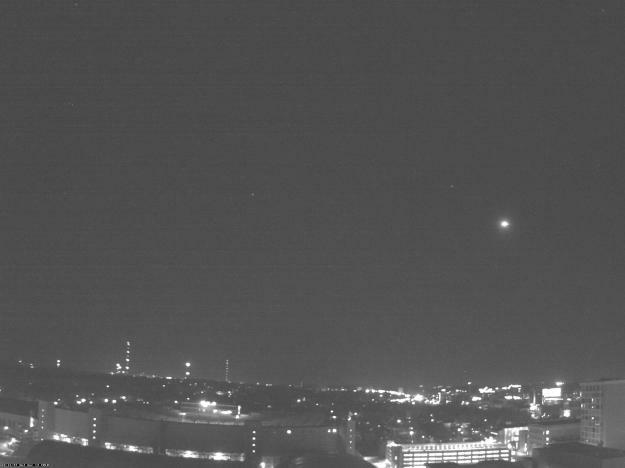 On clear nights we don't have that blanket to keep the longwave radiation in so the majority of it is sent out to space and as a result, cools the atmosphere. ...for the Annual Fermilab Tornado and Severe Storm Seminar with WGN's Tom Skilling! Where: Fermi National Laboratory, Ramsey Auditorium in Batavia, IL. When: Saturday, April 10th; there will be two sessions with each lasting about 4 hours. The first one will begin at noon and the second one around 6pm. It's free and open to the public! Be sure to come early as seats fill up quickly. Dr. Mary Ann Cooper MD, University of Illinois, Chicago: Lightning, Take it Seriously! Ed Fenelon, Meteorologist in Charge, National Weather Service, Chicago: Dual-Polarization Doppler Radar- Coming Soon! If you've got time and don't mind the drive, stop by and learn all there is about weather and forecasting. Ty and myself will be at the evening session. So come and say "hi". Clouds hung-around the Stateline all day today, as expected. The high temperature in Rockford only hit 42 degrees. That's 14 degrees below our average high of 56. I noticed clearing skies on the western horizon during my "dinner break" at about 7:05 pm tonight. So the clear skies are arriving just in time to give us a night of good radiational cooling. I'm going with a low of 28 degrees, but wouldn't be surprised if we go a little lower than that... Especially in outlying areas. Tomorrow we should warm-up pretty nicely, however. One of our computer models gives us a high of 60. But with the cold start, I am going with a high of 56. Either way, it's going to feel a lot nicer than Thursday did! We should be in the low-60s this weekend. And some 70s are possible by the middle of next week making this cold snap -- indeed -- a short-lived one. 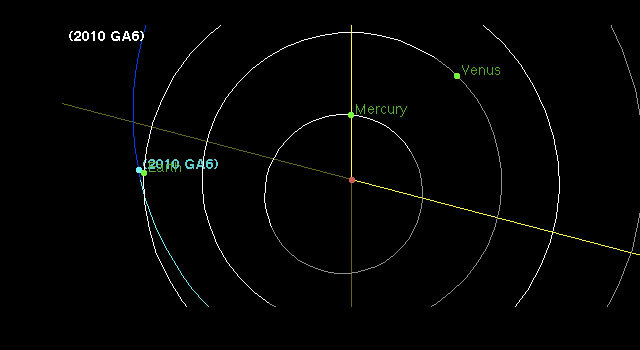 A newly discovered asteroid by the Catalina Sky Survey in Tucson, AZ will safely fly by Earth this evening around 6:06pm CST. At the closest approach the asteroid will be about 223,000 miles away from the Earth, which is about 9/10ths the distance to the moon. 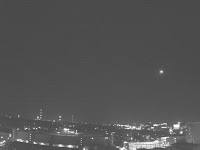 According to Don Yeoman, from NASA's Near-Earth Object Office at the Jet Propulsion Laboratory,fly bys of near-Earth objects within the moon's orbit occur every few weeks. You can read more about asteroids by clicking here. Too bad clouds will stick around through a good part of the evening. We've been a little spoiled in the Rockford area so far in April. We've had three days with highs in the 70s and two days with highs in the 80s. April 3rd and today were the only days that were anywhere close to normal... The high on April 3rd was 59. And while today's high of just 50 degrees is 5 degrees below average, tonight's pre-midnight low will probably be somewhere near 40 degrees, which is actually 6 degrees *above* average. The net result will probably be a seasonal April 7th in the record books. Even colder air will wrap around a departing area of low pressure tomorrow. Highs will only be in the 40s with a good chance of rain mixing with or changing to SNOW during the early morning hours. Since the ground is warm and actual air temperatures will likely stay just above freezing, accumulation will probably be an inch or less... and only on grassy surfaces. Took a quick glance at this and I almost fell out of my chair! Then I realized it was only a "test" tornado watch for Iowa's Severe Weather Awareness Week. The National Weather Service in the Quad Cities conducted a damage survey of the storms that moved through Carroll County Monday night between 8:45 - 9:00 pm. It was concluded that the storm produced a path of significant straight line wind damage from a downburst. The location was 3 miles west of Milledgeville, IL to 3 miles north of town. Estimated wind speeds from the storm - 90 mph. Mainly trees, outbuildings, garages and grain bins were damaged. But a church on the northwest of Milledgeville did receive damage when one of its walls collapsed. A severe thunderstorm watch has been issued by the National Weather Service for Winnebago, Boone, Ogle, Lee, and DeKalb counties until 4am. A line of thunderstorms stretching from the Quad Cities to near LaCrosse, WI continues to push to the east tonight. Although these storms are somewhat disorganized as of this writing, an upper-level disturbance moving across the region could help development. A cold front in central Iowa that is slowly moving east will also help to produce new storms, along with outflow from prior thunderstorms. The primary threat with these storms will be 1" diameter hail. It's also possible that we'll see winds approaching 60 mph in a couple of isolated incidences. The National Weather Service has extended a tornado watch from parts of eastern Iowa into Illinois now as of about 7:30pm. Carroll, Jo Daviess, and Stephenson counties are in this watch until 10pm. Abundant moisture remains over the area due to strong southerly flow and left-over moisture from last night's storms. Storms in central and eastern Iowa broke through the "cap" (a stable layer in the atmosphere) during the late afternoon hours. These storms are moving quickly to the northeast at about 50 mph. Now that the cap is broken, new storms will continue to fire tonight ahead of an approaching cold front. With the directional wind sheer that we have, rotating thunderstorms may develop. These storms are capable of producing tornadoes. After midnight, the tornadic threat should subside, but thunderstorms with hail, high winds, and heavy rain will be possible through about 5am. 7:25pm Update: Tornado Watch extended to include the counties of Jo Daviess, Stephenson and Carroll in Northwest Illinois until 10pm. Tornado Warning is in effect for the counties of Linn, southeastern Buchanan and southwest Delware Counties just north of Cedar Rapids until 8pm. This storm is moving to the northeast around 50 mph. Forecast Discussion: Thunderstorms continue to develop in southwest Wisconsin and northeast Iowa this evening. The warm front extends right over the Stateline with the surface low in Southern Iowa. Eastern Iowa remains very unstable right ahead of the low as moisture continues to be pumped in from the south. Storms will likely continue and move east/northeast as the cold front and low track over Northern Illinois. Severe Thunderstorm Watch for Green, Rock and Walworth Counties in Southern Wisconsin until 11pm. The warm front continues to move to the north this afternoon with clearing behind it. The southerly winds are pushing warm, unstable air into southern Iowa and as a result a Tornado Watch has been issued for Eastern and Southern Iowa until 10pm. We'll continue to monitor the area as storms are already beginning to develop within the watch area. We're still under a slight risk for severe weather this evening and overnight. The warm front is ever so slowly lifting north this afternoon. Looking at some of the short term models, the front is forecast to move just north of us between 4-6pm. Clouds are trying to break up just to the south so we may be able to get some sunshine in this afternoon. The surface low is forecast to move into east-central Iowa by late this afternoon. As it does, thunderstorms will likely rapidly develop ahead of the low and cold front in south-central Iowa and northern Missouri. As the cold front moves east into Illinois, storms will develop with hail and damaging winds being the primary threat. The greatest risk for tornadoes remains in southern Iowa, although if we can get storms to rotate some, an isolated tornado can't be ruled out. Be sure to keep checking back this afternoon for the latest updates! Severe thunderstorms moved through parts of northern Illinois Monday night producing wind damage and hail stones up to the size of baseballs near the suburbs! There was a very strong low level jet that the storms formed along, ahead of the warm front, with a few of the storms becoming supercells. The first round of severe weather moved into western Ogle County a little before 9pm. Wind damage was reported near Polo and Oregon, along with one inch hail. The storm then quickly tracked to the east producing wind damage in the Rochelle and DeKalb areas. Storms continued to develop to the west thanks to the low level jet, but also very strong winds aloft! The DeKalb storm continued to intensify as it moved across O'hare International Airport around 10:45am. At that time tennis to baseball sized hail was reported north of the airport in Des Plaines!! Later in the evening, another round of thunderstorms began to form in northwest Illinois and moved through the early morning hours bringing mainly a damaging wind threat across Freeport, Rockford, Marengo and Huntley before weakening north of Chicago. Thanks to the National Weather Service in Romeoville for putting together the storm recap! Today has the potential for a major bust day as far as temperatures go. The warm front is just to the south of us as indicated by the red line. Temperatures across Northern Illinois and Southern Wisconsin are in the upper 40s and low 50s, while just to the south of the front temperatures have risen into the upper 60s and lower 70s. As of right now the front is taking it's time moving north. The storms this morning produced a cooler boundary kind of keeping the warm front at bay for the moment. So, if we do not get on the south side of the warm front by this afternoon I think our high of 75° will a little far out of reach. However, if the front moves north and we can get into the sunshine, we will be able to reach atleast the 60s. This will also play an impact on our severe weather chances as we go through the evening and overnight. Something we'll watch very closely through the afternoon and evening. Chief Meteorologist Ty Shesky will have more to come. 7:21am: Cherry Valley - Winnebago Co: Hail - 1.00"
Forecast Discussion - Storms will continue to move through this morning with rain likely for the remainder of the morning. Storms developed along a warm front that lies just to the south of the Stateline. That combined with the low level jet (stronger winds in the lower levels of the atmosphere) helped to bring moisture into Iowa this morning. Storms moved east/northeast this morning causing heavy rain and hail. We were getting some reports up to 1.00" hail around the Rockford area. There may be a few more storms that develop as the morning wears on, but the anticipation is that the warm front will lift to the north eventually clearing us out for the afternoon. As it does, winds will also begin to pick up from the south becoming very gusty at times. Our attention will then turn to a cold front that will move in later this evening and overnight. That will be the next threat for strong to severe thunderstorms with hail and damaging winds likely. Severe Thunderstorm Watch is cancelled for Stephenson, Jo Daviess, Carroll and Whiteside Co. and continues for Winnebago, Boone, Ogle, Lee, DeKalb and McHenry Co. until 9am. 6:30am Update: Storms continue to move to the east this morning now moving into the Rockford Metro area. Storms will continue to fire along the warm front as it lifts to the north this morning. 6:07am Update: Severe Thunderstorm Warning for Stephenson County until 6:15am. Severe Thunderstorm Warning for Boone, Lee, Ogle and Winnebago Co until 6:30am. Storms continue to move to the east around 50-60 mph this morning. 9:44pm: Severe Thunderstorm Warning extended for Winnebago, Boone, DeKalb and now includes McHenry Co. until 10:30pm. There are two storms that we're watching. The first one was located just south of Belvidere and the second was just northwest of DeKalb. Both have very strong wind gusts with them and the possibility of large hail. 9:15pm: Severe Thunderstorm Warning for Southern Boone, Southeast Winnebago, Northwest DeKalb and Northeast Ogle County until 9:45pm. Rockford and Belvidere are included in the warning. Hail and 60mph winds are possible. 8:55pm Update: Severe Thunderstorm Warning for Ogle County until 9:30pm. The storm is currently near Forreston and moving to the east towards Bryon, Stillman Valley, Leaf River and Davis Junction. Look for hail, possibly quarter size, gusty winds and heavy rain. 9:10pm: Severe Thunderstorm Warning continues for Ogle county with 1.50" hail possible. 7:50pm Update: New Tornado Watch issued for Southern Iowa and Northern Missouri until 2am. Thunderstorms are expected to develop along the warm front as it moves into the watch area. Will continue to monitor the storms through the night. 7:20pm Update: Showers and storms will continue to lift off to the east/northeast this evening ahead of the warm front. A few of the storms that have moved through have produced pea/penny sized hail. There is a Severe Thunderstorm Warning in Eastern Iowa for Dubuque County that might need some watching as it moves in Western Jo Daviess county. Although, it does look like it is weakening a bit. Still looking at storms along the I-88 corridor that could produce hail as they move to north/northeast. Look for storms to continue to move through this evening and overnight as the warm front lifts to the north. Strong wind and hail will continue to remain the primary threat. Just wanted to give you a quick update on the weather this afternoon. The National Weather Service in the Quad Cities has issued a Flash Flood Watch for the counties of Jo Daviess, Stephenson, Carroll and Whiteside counties beginning tonight and lasting through Tuesday night. Elevated thunderstorms are beginning to develop well north of the warm front in central and south-central Iowa this afternoon and as a result a Severe Thunderstorm Watch has been issued. Dew points are still rather dry - we've dropped into the upper 30s this afternoon. A few elevated storms will continue to move into the WTVO viewing area within the next couple of hours. Not anticipating anything severe from those, maybe pea sized hail, but as the front lifts north this evening, storms will become more likely and continue into the overnight with hail and strong winds being the primary threat. The reason why the National Weather Service has issued a Flash Flood Watch is because some of the storms will have the potential to "train" or continue moving over one spot producing heavy rainfall. We'll continue to monitor things as the afternoon progresses. Be sure to keep checking back for the latest! We've been talking about it for the past several days the potential for stronger thunderstorms to move through tonight and tomorrow across the Stateline. The storms that fired Sunday evening formed along a weak boundary that is now off to the east. A warm front sits to the south through Missouri and is the focus for storm development this morning. The warm front is expected to move north as the afternoon progresses bringing the storm threat across the Stateline later this evening and overnight. Dew points right now are not all that impressive as the bulk of the moisture remains to the south. As the evening moves on, the low level jet (stronger winds in the lower levels of the atmosphere) is expected to bring the moisture north with the front. Storms will likely develop as the front moves through thanks to the sunshine (instability) we're seeing this morning, the front providing the lift and the additional moisture. If any of the storms do develop and reach severe limits, hail and wind will be the primary threat. Although if storms form right along the front, isolated tornadoes can't be ruled out (this will primarily be to the southwest of us). Storms will likely be ongoing Tuesday morning as the warm front stalls just to the north. With it being so close, thunderstorms may be likely in the afternoon before a cold front moves through Tuesday into Wednesday. Another threat with any of the storms that move through will be the heavy rainfall and flooding. Some of the models are bringing in over 2 inches of rain by Wednesday morning! That will be something else we'll be watching. The Storm Prediction Center does have the entire Stateline in a slight risk today and tomorrow. We'll keep you updated through the afternoon and evening so be sure to keep checking back. The 1st Round of Storms is Done.. Wait till Monday Night! A relatively narrow higher dew point moisture channel has been focused directly into the the Stateline in advance of a slow moving cool front over eastern Iowa by a strong low level jet stream. There have been some areas with moderate amounts of rainfall. There has been some large hail associated with severe thunderstorms moving eastward out of Iowa across the Quad Cities into Whiteside county. Morrison in Whiteside county reported hail to an inch and a half. Muscatine Iowa reported I" hail. As of 9 pm there have been no reports of large hail in the Stateline area counties, and there will not be any severe weather in the area tonight. The showers and are ending from the west, and skies will become partly cloudy after midnight. The cold front will sag toward the southern tip of Illinois by morning, and become stationary briefly before it becomes a warm front, and starts moving back toward the north. With low pressure developing over the plains a strong low level southerly moisture laden jet will develop pumping vast amounts of Gulf air up and over the northward liftting warm front. After an early morning with some sunshine it will quickly cloud over again, and some thunderstorms will spread into areas south and west of the Stateline during the afternoon. As the front continues it's northward movment into northern Illinois on Monday night severe storms will be possible along with heavy rains that will persist through the night into Tuesday morning. On Tuesday it looks like the front will continue lifting off to the north putting our region in warm gulf air with temperatures reaching well above normal into the upper 70's. The front will be nearby, though, so there may be more thunderstoms during the day. A cold front will slip slowly eastward on Tuesday night renewing the threat of more severe thunderstorms overnight. The storms will finally come to an end early on Wednesday, but showers will linger on Wednesday into Thursday as cooler air settles in. The high pressure moving into the area mid and late week will be of Pacific origin, so although it will be cooler, temperatures will still be near or slightly above average Thursday, Friday, and Saturday under mostly sunny skies. 6:45pm Update: Storms continue to move to the east into Sterling and Dixon. Watch for gusty winds, heavy rain and possibly hail. 6:10pm Update: Severe Thunderstorm Warning for Whiteside county until 7pm. Watch for heavy rain and hail as this storm moves to the east. 5:30pm Update: Storms continue to push off to the east, south of I-88 this evening while general rain moves to the north across Northern Illinois. There are some storms in Northeast Missouri and Southeast Iowa that need to be watched through the evening. As of right now, there have been no other watches or warnings issued. 3:30pm Update: The Storm Prediction Center has issued a Tornado Watch for the counties of Carroll and Whiteside until 11pm tonight. Storms are beginning to develop just south of the Quad Cities along a weak boundary and are moving northeast. Hail and heavy rain remain the primary threats, although an isolated tornado can't be ruled out. 1:00pm: Look for a couple showers this afternoon as a cold front approaches from the west. We'll likely see them increase later in the afternoon and evening. Moisture isn't too abundant at this moment, but with southerly winds gusting we may begin to see dew points rise through the afternoon and evening. As the front approaches, storms will likely develop as moisture becomes a little more available. We'll continue to monitor the weather through the afternoon. The Storm Prediction Center does have most of the WTVO viewing area under a slight risk with hail and damaging winds being the primary threat. Be sure to keep checking back for the latest information. Rain showers continue to lift off to the north/northeast this morning. Just look for a steady light rain, especially east and south of the Rockford area. The rain should be out of here by the afternoon - just leaving mostly cloudy skies by the evening. Sunday should remain dry, but we could see some more rain move in Sunday night into Monday. The storms that produced strong winds in Eastern Iowa this afternoon are now beginning to move east across the Mississippi River. While we're not anticipating any severe weather this evening, gusty winds and heavy rain might be possible as the storms continue to roll through. This is a quick mover, so the rain should be out of here by Saturday afternoon. 12pm Update: The storms are quickly lifting north/northeast this afternoon already pushing through central Iowa. The slight risk for severe weather has been extended up through eastern Iowa and includes Jo Daviess county and the western parts of Carroll and Whiteside county. While the storms are weakening, strong winds may be possible as some of the storms move closer to the Mississippi River. Look for more showers and storms to move in during the evening and overnight. Mostly cloudy skies can be expected through the rest of the afternoon as a cold front continues to move east into Iowa and Missouri. Watching a line of thunderstorms move through parts of Northern Missouri that produced wind damage in Eastern Kansas, Oklahoma and Western Missouri. This line will continue to move off to the east and northeast through early afternoon. We are under a general thunderstorm risk this afternoon while a slight risk for severe weather extends from the Iowa/Missouri border, through Arkansas and into parts of Texas and Louisiana. We are expecting some thunderstorms to roll through later this evening and overnight as the front passes. While it doesn't look like it should be severe, don't be surprised if hail, gusty winds and heavy rain occur with some of the storms that move through. ...to the world's first weather satellite! 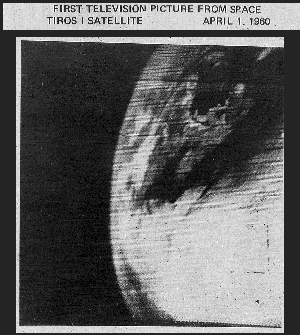 It was on this day back in 1960 the TIROS-1 (Television Infrared Observation Satellite) lifted off from Cape Canaveral, FL and opened a new dimension in weather forecasting. The first image taken from the satellite was a fuzzy picture of clouds over the United States. The next one, a couple days later, showed a typhoon off the east coast of Australia. The TIROS-1 satellite, weighed 270 pounds and carried two cameras and video recorders. Even though it only lasted 78 days, we are still seeing its impact today! To read more on the TIROS-1 satellite, click here.